MatchMaking Meetup hosted by Primalbase on 14 February 2019. 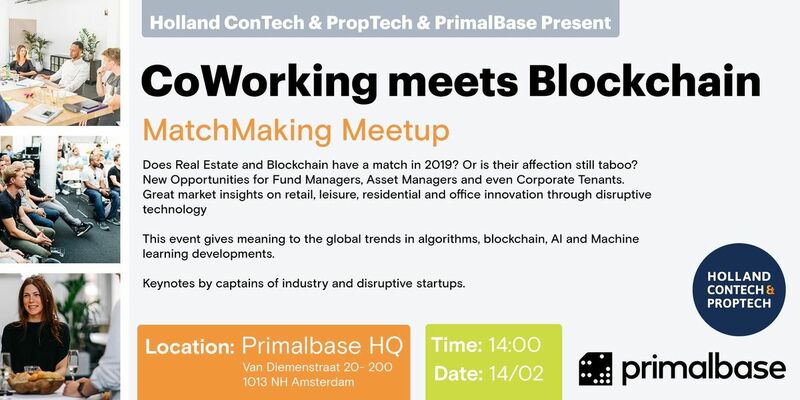 Holland ConTech & PropTech and Primalbase Present CoWorking meets BlockchainMatchMaking Meetup Valentines edition. Does Real Estate and Blockchain have a match in 2019? Or is their affection still taboo? New Opportunities for Fund Managers, Asset Managers and even Corporate Tenants. Great market insights on retail, leisure, residential and office innovation through disruptive technology. This event gives meaning to the global trends in algorithms, blockchain, AI and Machine learning developments. Keynotes by captains of industry and disruptive startups. As this is an international event all keynotes will be given in English. If you are not present at the meeting for which you have registered without giving a reason, Holland ConTech & PropTech is unfortunately obliged to send you a no-show declaration due to the costs we have incurred for your reservation. The costs we charge are €95,00 excluding VAT. You can cancel free of charge up to 48 hours prior to the event. Daan van der Vorm (VORM): "I thought it was a great afternoon. There was a lot of new energy this afternoon and a few very nice new things. So I really enjoyed it. Super afternoon. I connect to your platform." Peter Lammertink (Heembouw): "The organisation of the Matchmaking Meetup was not only great fun to do, it has delivered us a lot! My entire organisation was suddenly motivated and involved in innovation and new technology. After the event, our employees also told how proud they felt to host such a club of innovators." Caroline Beelen (G&S Vastgoed): "I really liked the fact that there were so many different startups today. They can also be used in different ways from different angles and certainly for project development." 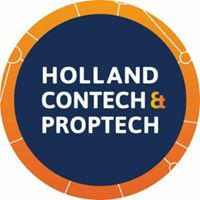 When signing up to a Holland ConTech & PropTech event, Holland ConTech & PropTech is allowed to use your personal details (name, company) to create an attendance list. Email addresses will not be shared unless agreed to by the attendee. Video footage and photos will be taken during this event, which may or may not include your recognizable image. Please be advised, by participating in this event, you agree to allow Holland ConTech & PropTech and PrimalBase to use the images in print, digital or web-based formats for promotional and archival purposes. If you do not wish to have us use your image, please notify the event organizer.